We all have a metaphysics – a worldview – whether we are aware of it or not. Science can and should contribute to that worldview of how things are and work, but should not monopolize it. We should locate scientific understanding within a wider view of knowledge that gives equally serious consideration to other metanarratives and forms of human insight and experience. Perhaps we must learn to respect both domains to understand fully the world in which we live. We can conveniently call the scientific perspective “physics” and the stereoscopic view “metaphysics,” which goes beyond (“meta”) the purview of science alone. Both provide what we can call a “working” knowledge of reality for getting things done, whether they are an entirely accurate reflection of Reality, or not. Both scientific and metaphysical theories or models must be beautiful: elegant, economical, and coherent, despite any application of their criteria. Metaphysics must explain the entire set of phenomena fundamental to human experience. This can be done, as in physics, from a top-down or bottom-up approach. In science, top-down means from the cosmological to the subquantal level of observation. In metaphysics, we work from the biological/emotional/mental to transpersonal or archetypal levels of experience and expression. In physics, matter/energy is foundational, while metaphysics considers consciousness even more fundamental. Quantum or nonlocal mind models also reflect the later. We can examine a wide or narrow view of the nature of Reality and our own nature, both scope and detail. Is physics coming around full circle back to Natural Philosophy after only 500 years? The so-called new physics is described even by its practitioners as “mystical”. Sir Isaac Newton, godfather of modern science, wasn’t merely a scientist, but also an experimental alchemist. Alchemy was the search for the Godhead in matter. Today we refer to that negentropic source as the vacuum potential, vacuum fluctuation, zero-point energy, or synergetically (Fuller) as Vector Equilibrium Matrix. It is the dream of many that mankind can tap this ocean of potential as a free energy source that increases our survival potential. Metaphysicians suggest harmonizing or resonating psychobiologically with this low amplitude resonance enhances spirituality. It is the groundstate of consciousness. ‘Nous’ is an ancient word for what we now call nonlocal mind or consciousness. Many philosophers and modern physicists consider ‘consciousness’ as the fundamental basis of all that is. Nous is, curiously, the French term for ‘we’ or ‘us’. And, indeed, we are That. This metaphysical Source of all that exists lies at the threshold where Nothing becomes something – where the universal becomes the particular. Such is not the usual realm of science, but that of Transpersonal, Jungian or archetypal psychology, which examines the deeper meanings of concepts which are metaphors of our existence – an artistic or aesthetic as well as deductive method. Aristotle considered ‘nous’ a faculty of the human soul. Today, soul is studied in the domain of these sacred psychologies. Through metaphysics we contemplate both exterior and interior perceptions of the underlying structure of the universe. Can we be scientifically conservative and metaphysically bold, simultaneously? It means walking the narrow edge of Occam’s Razor. Often metaphysical ideas are metaphorical and burden us with false assumptions and irrational quantum leaps of logic. It is not that our subject should be rational and linear, but these arguments are constructed such that if you believe this underlying premise, it is assumed certain outcomes result. At best this is the old mechanistic model of causal or classical physics, not the counterintuitive quantum world. But the vacuum potential appears to be much more than a metaphor. It is the most fundamental phenomenon we are currently capable of perceiving. It provides us with a new paradigm for our very existence – one that recognizes wholeness, connectedness, integration, and participation in the universal scheme. Every ‘thing’ – from concepts to objects --including the universal waveform originates from the fertile and “whole sum” womb of spacetime. This is also the domain of nonlocal mind. Andrei Linde of Stanford has suggested the expanding fractal universe generates emergent information that could be poetically considered an evolving universal intelligence. If so, it is an emergent property of spacetime as is every thing. But seemingly-separate things are a construction of our minds [maya, illusion], an overlay of what is essentially one unbroken movement – a dynamic verb, not a group of nouns. The largest component of our corporeal existence is the vacuous space between the atoms that make up our physical bodies which are far from solid from the quantum perspective. We are undergird and literally in-formed by that pervasive infinite informational flow. For Plotinus (§4), nous comprises ’primary reality’, the domain of intelligence and intelligible beings. He construes this domain as an ’emanation’ from the ineffable One, the ultimate principle of everything. Taken universally, nous corresponds more or less to a syncretism of Plato’s Forms with Aristotle’s Unmoved Mover. Everlastingly contemplating the One, nous is construed as an equivalence between thought thinking itself and intelligible beings as the only true thinkables. The activity of nous ’overflows’ into ’soul’, the principle of embodied life. As a lower level of reality, soul can only think things by treating them successively and separately. Human beings live primarily at the level of ’soul’, but they also, by virtue of their immortal and ’undescended’ self, have access to identification with nous and thereby to a mode of being in which thinker and thought are completely unified. In this transcendent condition, the mind is reality itself. Time and space are simply functions of velocity. You can examine the time increment or the space increment separately, but they are never independent of one another. Space is the absence of events, metaphysically. Space is the absence of energy events, physically. Space is the antithesis of solid. Both are misnomers. Solid (or mass) refers to locals of too high an event frequency for our physical members to penetrate or conceivably tune in. Space refers to locals of an event frequency per volume too low for our apprehending equipment to tune in. Space is all the observer's untuned-in information. Space is finite as a complementary of finite Scenario Universe. As a co-occurrent, complementary function of finite but non-unitarily-conceptual and non- unitarily-tune-in-able Scenario Universe, space is finite. Space does not have definable properties. Only systems have definable characteristics. The cognitive awareness of space derives from definition of system characteristics whose topological interrelationships inherently and coherently divide Universe into insideness microcosmic space and outsideness macrocosmic space. Systems have 32 topological characteristics Space is the integral of all the frequencies that are too low for tune-in-ability. Space is the aggregate of all the vector equilibrium nulls of all magnitudes and frequencies of all isotropic vector matrixes always potentially articulatable in all directions from any point of origin. Space is never linear. Physics finds that Universe has no solid things surrounded by, and interspersed with, space. Life is an inventory of tuning-ins and tuning-outs of experience. Birth is the first tuning in; death may not be the last. Systems divide all of Universe. Thought divides all of Universe. Thought is inherently systemic__whose inherency always has its coherency of space. Only systems can communicate space. Space is systems-defined-and-deferred awareness of potentially tunable otherness. The only instantaneity is eternity. All temporal (temporary) equilibrium life- time-space phenomena are sequential, complementary, and orderly disequilibrious intertransformations of space-nothingness to time-somethingness, and vice versa. Both space realizations and time realizations are always of orderly asymmetric degrees of discrete magnitudes. Physics thought it had found only two kinds of acceleration: linear and angular. Accelerations are all angular, however, as we have already discovered. But physics has not been able to coordinate its mathematical models with the omnidirectional complexity of the angular acceleration, so it has used only the linear, three-dimensional, XYZ, tic-tac-toe grid in measuring and analyzing its experiments. Trying to analyze the angular accelerations exclusively with straight lines, 90-degree central angles, and no chords involves pi and other irrational constants to correct its computations, deprived as they are of conceptual models. The model of nonlocal time helps us supercede mechanistic notions of space and time. 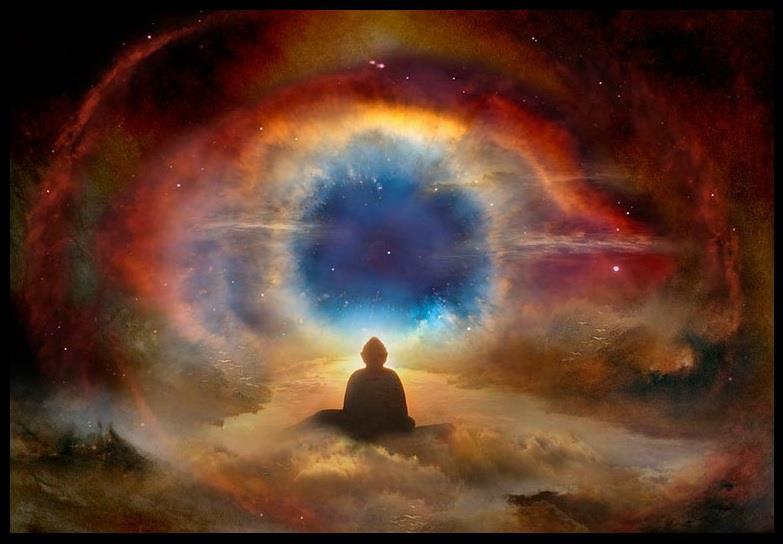 The universe is infinite, and so is the mind, not in the individual personalistic sense, but in terms of consciousness. The Greeks conceived of the mind as both limited and infinite, human and divine. The root of this notion comes from Hermetic and occult sciences, attributed to Hermes Trismegistus. The mind is not localized nor confined to the body but extends outside it. This notion lies at the root of sympathetic magic. These notions were superceded by later causal and mechanistic views that came to dominate Western science and medicine. The nonlocal mind paradigm suggests we can effectively operate with the realization that consciousness can free itself from the body and can act not only on our own bodies, but nonlocally on distant things, events, and people, even if they are unconscious of the intentionality. It also suggests a new emergent healing paradigm. It has been proven that human minds display similar interactions at a distance (Krippner, Mishlove, Radin, May, Motoyama, Sidorov). These anomalies include therapeutic rapport, telepathy, clairvoyance, precognition, visions, propohetic dreams, breakthroughs, creativity, prayer, synchronicity, medical intuition, nonlocal diagnosis, spontaneous remission, and intent mediated or paradoxical healing. Nonlocal mind erupts spontaneously, surprising, even shocking us. The mind has ultradimensional qualities unlimited by physical constraints. Rooted in relativity, quantum, holographic and chaos theories, a nonlocal metaphysical context suggests such a paradigm shift from the purely causal healing model. The interactive field (psychodynamic field) present in healing situations can be amplified intentionally through therapeutic entrainment, or resonant feedback playing off the unified field (universal field). Nonlocal mind operates at the most fundamental level. There is a pre-physical, unobservable domain of potentiality in quantum theory. It is the basis of fundamental interconnectedness and wholeness of Reality. This cosmos is, indeed, greater than the Whole SUM of its parts. Theories of the physical vacuum will eventually prove useful in understanding life. For example, it may link biology and consciousness. Rather than an inconsequential epiphenomenon, consciousness is a causal factor in biology. The body is a colloidal suspension that can act like an amorphous liquid crystal, resonating and superconducting in a variety of ways. Quantum mechanics determined the primacy of the inseparable whole. Holism is intrinsic to any quantum theory for biology. Descriptions of isolated systems are permissible only under experimental conditions. Holistic properties are defined mathematically in EPR [Einstein-Podolsky-Rosen] correlations. It implies fundamental interconnectedness within the organism, between organisms, and with the environment. Holistic biophysics is therefore an integrative subject, a specialized but transdisciplinary pursuit. Quantum biology must refer to non-equilibrium thermodynamics, since organisms are open systems best described by complexity. Issues include coherence, macroscopic quantum states, nonlocal interactions, nonlinearity, communication networks, self-organization and regulation, field models, interconnectedness, and consciousness. Field-thinking and field-models are central to bioelectromagnetics. The vacuum is filled with virtual photons whose motion constitutes the “zero-point energy”. This “cosmic zero” may be related to consciousness in some as-yet-unknown way. ZPE fluctuates because this fundamental domain is not smooth but consists of virtual particles boiling into and evaporating out of existence. But where did all these photons in the vacuum originate from? They originated on all the other particles throughout the universe. Each particle sees itself in the center, surrounded by distant matter. The central electron only sees an electron out at the edge when their velocities line up and this only occurs when they are “in sync.” The key is when their periodic motions remain in step with each other. In this “phase locking” all electrons in the coupled system orbit around their average position at the same frequency. This is the womb of quantum mechanics, but we don’t see the inner workings, just the “fuzzy ball” of probability on the outside. The phase conditions for stable orbits [Higgs’ Phase] will only be right at certain spots. The places at which stable orbits can occur will form a regular array resembling “crystal structure” at very small scales in space, so electrons actually “jump” from one such point to another. Frequency has a very definite physical meaning. It is the rate at which the electrons (or any particles) orbit their center of mass location. Coherence between parallel realities can be thought of as hyperdimensional structure which crosses dimensions. It is nonphysical yet has physical manifestations. Higher dimensional structures can be designed which, by their shape and topology, are stable. Such forms may be a possible model for consciousness and the soul. The hypercube is one such hyperdimensional structure that has a long mystical tradition (Merkabah; Cube of Space). “Bose particles” are photons which like to be in the same state; they become entangled or entrained, sharing a frequency. The body creates coherent light. In the cell structure of the body there are membranes which act as conductors of microwave, infrared and visible light. These structures store coherent photons [biophotons] which play a fundamental role in life processes.